According to the U.S. Consumer Reports Safety Commission, more than 15,000 fires are sparked every year by clothes dryers. Lint and other debris can build up in your dryer vent, reducing air flow to your dryer, backing up dryer exhaust gases, creating a hazard. Clothes dryers are an appliance that makes our lives easier but we often take them for granted. We shouldn’t. We need to maintain them and most importantly have their vents cleaned. The first sign that you might have a clog is when your dryer stops drying your clothes in one cycle. The dryer is designed to exhaust the heat and the moisture while it’s drying. If that heat and moisture cannot get out of the dryer, then the dryer just sits there and keeps working itself but it can’t accomplish the drying. That means the dryer works harder and heat builds up and that is what can lead to a dryer vent fire. This can become a bigger problem in homes where the dryer is placed in the center of the home rather than up against an outside wall. As a result, the vent can run quite a long distance. We see 15, 20, 25 foot vents all the time. The longer the vent, the harder it is for the dryer to get the lint out. Those homes with longer vents are more susceptible to fire. We recommend you leave dryer vent cleaning to the professionals. They have the proper tools and additionally, they know whether your dryer vent needs cleaning or if it’s time for a new dryer. 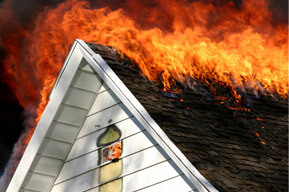 In the case of a home fire, make sure you are covered. Call us today for a Dallas homeowners insurance quote at 972.234.5588.